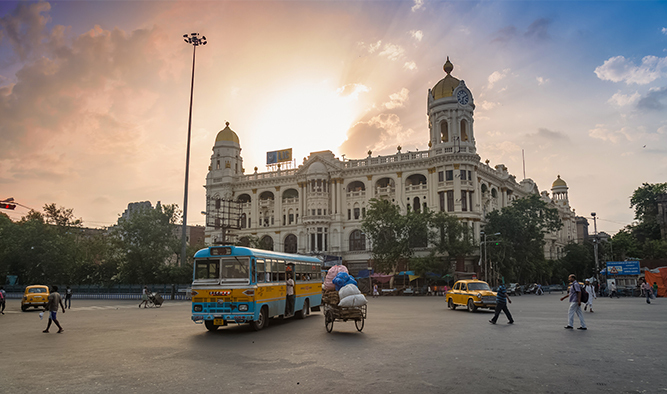 Each nook and corner of India is steeped in its rich culture. Experience them on RV Bengal Ganga. This journey from Kolkata to Varanasi will acquaint you with the soul of this country. The 12 day voyage, complemented with luxurious accommodation, will be a travel experience you will remember for a lifetime. 8 nights onboard RV Bengal Ganga and 3 nights in hotels. All meals from lunch on day 1 to breakfast on day 12. Embark in time for lunch. In the afternoon, visit various colonial monuments of the city. This is followed by a visit to the Writer’s Building and Treasury Building, accompanied by a photo walk at St. John’s Church and the Victoria Memorial. Sail to Kalna. 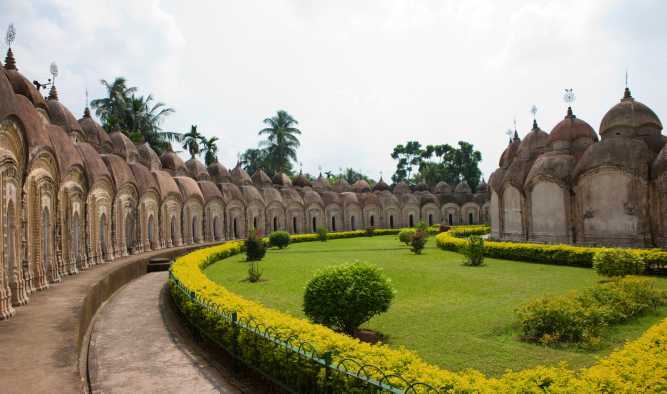 Take a cycle rickshaw ride to the enchanting Rajbari Temple Complex in Kalna. See Bengal’s temple architecture and themes of Hindu epics and mythical lives of saints, gods and goddesses. Return to the ship and cruise towards Matiari, arriving in the evening and mooring for the night. In the early morning, visit the village of Matiari to observe the process of brass making. After that, return to the ship, for a cruise towards Murshidabad, sailing past Plassey. Visit the historic town of Murshidabad and take a tonga ride to witness the oldest mosque in town, Katra Mosque. It is then followed by a visit to the Hazarduari Palace Museum, built during the reign of Nawab Nazim Humayun Jah (1824-1838 AD). Explore the historic Farakka Lock Gate. After exploring the Feeder Canal, the ship sails through the Farakka barrage at a distance, which regulates the water of the Ganges in Bangladesh and India. Reach Samtaghat. The ship sails to Bateshwarsthan in the morning. After arrival, take a short ride by jeeps or cars to the excavation site of the Vikramshila University, one of the largest Buddhist universities in the past, with more than one hundred teachers and about one thousand students. The morning starts by sailing towards the rocky island Sultanganj, which is known for two great rocks of granite and an important pilgrim centre. It is known as Jahngira, which means ‘the hill of Jahnu’. Visit Munger, one of the largest cities and most industrialized in the state of Bihar. Its history can be traced back to the mythological era of Ramayana and Mahabharata. After lunch, visit the Bihar School of Yoga, founded in 1964 by Satyananda Saraswati and his spiritual successor Niranjanananda Saraswati. Disembark in the early morning and enjoy a visit to Nalanda. It treasures a glorious past of academia in India and extraordinary architectural ruins. During late afternoon, visit the Mahabodhi temple, a UNESCO World Heritage Site. After early breakfast, drive to Varanasi, one of the holiest cities for Hindus in India. During late afternoon, ride on a cycle rickshaw and experience the enchanting and incredible life on the streets of Varanasi, followed by a visit to the ghats, the steps leading to the river. Start the day with a sunrise Boat Tour to witness the incredible scenes along the Holy River. After lunch, we visit Sarnath, where Lord Buddha gave his first sermon after attaining enlightenment. The Archaeological Museum at Sarnath houses a large collection of sculptures from the glorious Indian past. Transfer to the airport for your flight or depart to your onward destination.